Avallon, Bassens, Bourges, Cholet, Clermont- Ferrand, Golbey, La Roche, Le Puy, Montceau, Roanne, Sarreguemines, Seclin, Toul, Tours, Troyes, and Vannes. In 1990, the Michelin group created the Company of Industrialization and Economic Development (SIDE) – known as Michelin Développement – to support sustainable business development of the areas in which it is established. 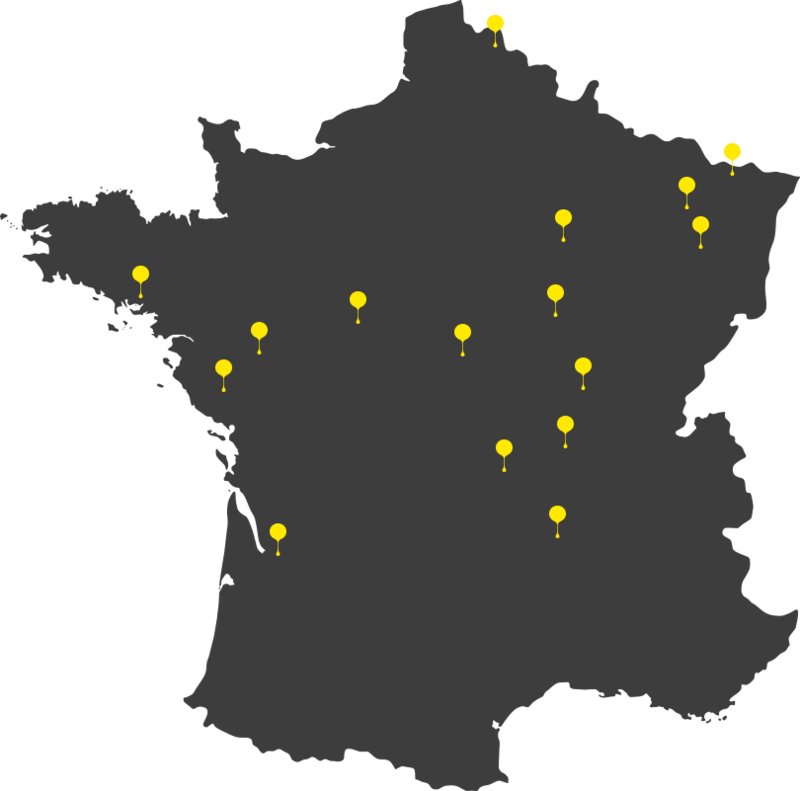 Michelin Développement offers technical and/or financial assistance in connection with the regional economic organisations. Between 1990 and 2006, SIDE supported the development projects of 550 companies, accompanying the creation of 12,200 jobs for a total amount of loans of more than 40 million Euros. Moreover, each year a division of competences is offered to more than 50 SMEs located on the basins of establishment of the Michelin factories. The Michelin Développement program that began in France has been instigated in other parts of the Michelin world as you can see from other pages on this site. Seclin is located to the south of the Lille conurbation in the north east of France. This strategic location is just one hour away from both Paris and Brussels and just two hours from London. Sarreguemines, located in the Moselle region, is at the heart of Europe. The city is only 80km from Metz, and 90km from Saarbrucken, the capital of Saar in Germany. This urban region has a hinterland of over 600,000 people and therefore constitutes an excellent place for contacts and exchanges between France and Germany. With excellent transport links, including airports at Saarbrucken and Metz, this makes Sarreguemines an ideal location for trade and economic development. Toul profits from its exceptional geographic location at the entrance to the ‘Grand Région’ (Saare, Lorraine, Luxembourg, Rheinland, Pfalz, Wallonia) and near to Nancy and its urban centre. At the crossroads of the major transport links of the TGV European and the Moselle Canal, Toul has excellent transport links to Rotterdam, Amsterdam and Antwerp in the North, Frankfurt, Stuttgart and Basle in the East, and via the Danube to Vienna, Bratislava, Budapest and on to the Black Sea. With a market of 70 million consumers within a 300km radius it is no wonder that Toul has a high concentration of diverse industries. Located at the commercial, industrial and tourist crossroads from Germany, Belgium and Switzerland, Epinal profits from developed communication links allowing fast access to many large French and European cities. The TGV provides a fast European-wide service with easy connections to Germany, Switzerland and Italy, and Paris is less than two and a half hours away. The Epinal area is characterised by a strong density of small and medium sized businesses and is also home to large multinationals such as Trane, Allied Signal, Woco, Norske Skog – and Michelin. The Champagne-Ardenne is ideally located near the Paris basin and thanks to its modernised infrastructures of the TGV, Paris-Vatry airport, autoroutes and waterways, it has excellent access to other major cities in Europe. Situated on the west coast of France with all the advantages of a beatiful climate, Vannes has an excellent network of expressways and motorways: Rennes, Nantes and Quimper are only one hour away with Saint-Brieuc and Brest less than two hours, and Paris just four hours. The railway network is equally impressive with a frequent TGV service to Paris and there is an airport just one hour away which services the main international hubs. The Vendée occupies a central position on the Atlantic coast and consequently is located at the junction of the principal road network which connect the urban areas of the whole of the West coast of France. It is in the middle of a major economic zone of influence which has a population of more than eight million and a business sector of around 500,000 companies. As well as being well placed for the West, the Vendée is also well connected for the rest of France with a good transport network, which includes road, rail, maritime and air infrastructures. The Vendée has a powerful and diverse economy with both a strong SME/artisan community and international industrialists. In fact, its economic dynamism and entrepreneurship is so developed that there is one company per 17 inhabitants. Located in the middle of a triangle formed by the towns of Nantes, Angers and La Rouche, the Cholet area provides direct access to the large areas of Brittany, Poitou, Charente, the southern side of the Île-de-France (Paris and its environs) and Normandy. The opening of the A87 motorway has allowed a fast expansion of the territory and with access to 32 zones of economic activity it is an enviable location with a flourishing economy. The area of Tours is known for its quality of life. With the presence of the Loire and Le Cher, and important historical and heritage sectors along with beautiful architecture, public spaces, the university and both sporting and cultural facilities, this is a lovely place to live. Tours is located at the centre of a motorway star with five branches – A10 Paris, A85 Nantes, Tour- Bordeaux, A28 Rouen and Le Mans – providing access to the North of Europe by circumventing Paris. The area is serviced by two important railway stations at Tours and Saint-Pierre-Corps, thus opening up fast access to France with direct connections with Rossy CDG, Thalys and Eurostar. With a long established industrial tradition, Bourges has evolved with time and the economic context. Industries include aeronautics, armament, the mechanics and working of metals and ceramics, plus logistics and the manufacture of luxury goods. Bourges is in the ‘Le Cher’ department which has a central and strategic location at the centre of France, with access to the excellent motorway network there are direct connections with Italy, Germany, the United Kingdom, the Benelux countries, Spain and Portugal. Located on the motorway between Paris and Lyon, Avallon is the home of the large production facilities of SKF, Schiever and Michelin. The town with its excellent transport links also has good industrial accommodation for smaller businesses. Located in the south of Burgundy in the department of Saone-et-Loire, Montceau is at the crossroads of the principal European axes of communication, notably the A6 motorway and the Paris to Lyon TGV railway. The urban community Creusot Montceau is an economic centre of international standing in the sector of nuclear competitiveness and its university research platform is working in advanced technologies. Thanks to its excellent geographical position and infrastructure, it is the first industrial centre between Paris and Lyon and the home of the second largest university in Burgundy. As one would expect, it is home to several large technological companies including Areva, Arcelor-Mittal, Alstom and the General Electric, but also has a strong SME community. The community also benefits from an optical fibre network. A city of 150,000 habitants located in the centre of France, Clermont-Ferrand is the capital of the Massif Central region. Accessible by excellent road and rail links, the city has been opened up to the national and international community thanks to the development of its airport. Clermont-Ferrand profits from a large academic quarter with more than 34,000 students. Training supports research with nearly 5,000 public and private sector researchers working on technologies of the future. The city is also the home of the Michelin Group and benefits from its position as the largest tyre producer in the world. The SME community is strong, especially in the fields of health, mechanical engineering and agriculture. Located to the West of the Rhone-Alps area, the district of Roanne has a population of around 150,000. The region is well known for its entrepreneurial spirit and situated only 100km from the three large cities of Lyon, Clermont-Ferrand and Saint-Etienne, making this an excellent location for business. A new direct motorway connection with Lyon will be operational from 2012. Bassens is located in the eastern outskirts of Bordeaux within an area which is renowned for being one of the most dynamic in France, with Bordeaux being the driving force for the development of this area. With a highly educated and qualifed workforce, the area is a technological centre and boasts four universities, 200 laboratories and 5,000 researchers. Le Puy is a small historic town at the centre of the department of Haute-Loire in the beautiful hills of the Auvergne region. Clermont-Ferrand is about 100km away. The population concentrates primarily around the basin of Puy-en-Velay, Yssingeaux – Saint Etienne and Langeac – Brioude.